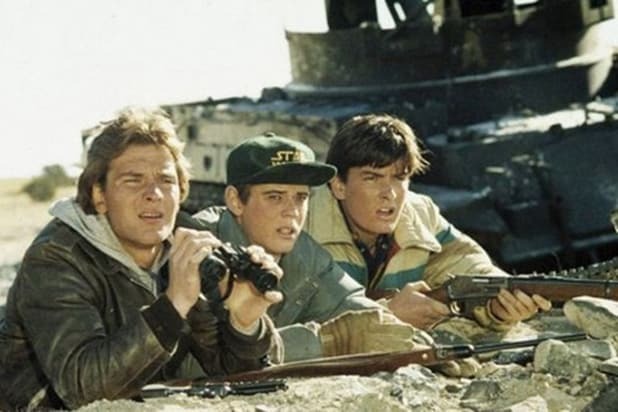 1984 - "Red Dawn" Sheen's first major role was in 1984's "Red Dawn," the country's first movie with a PG-13 rating. Sheen stars in the movie about a Soviet invasion of the US alongside heavy-hitters like Patrick Swayze, C. Thomas Howell, Lea Thompson and Jennifer Grey. 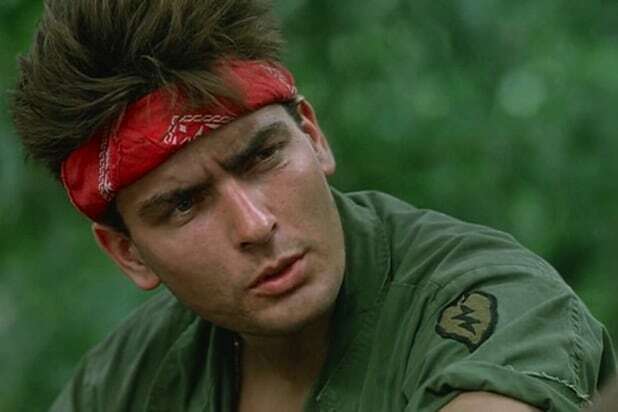 1986 - "Platoon" In 1986, Sheen starred in the year's Best Picture winner at the Oscars, "Platoon." The movie marked the start of his relationship with director Oliver Stone. 1987 - "Wall Street" Sheen starred with his father, Martin Sheen, in Stone's "Platoon" follow-up, "Wall Street." When Sheen was passed over for Stone's next film, "Born on the Fourth of July" in favor of Tom Cruise, the actor-director duo had a public falling out. 1991 - "Hot Shots!" 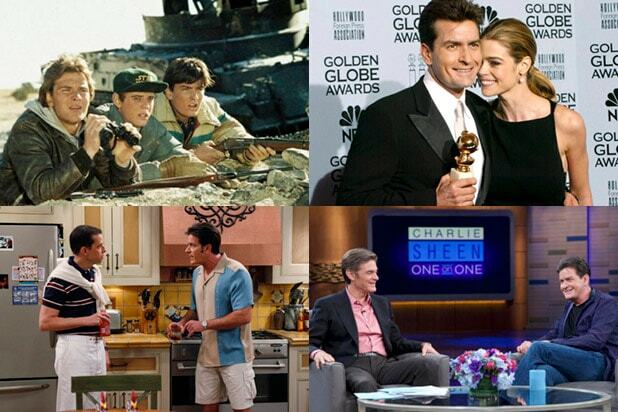 Following his work with Stone, Sheen's movie career continued with roles in films including "Young Guns," "Major League" and "Hot Shots!" 1998 - Overdose In 1998, following several stints in rehab and a public struggle with drug abuse, Sheen suffered a stroke due to an overdose. 2000 - "Spin City" The actor had a career resurgence on TV in 2000. He replaced Michael J. Fox as the lead of the ABC series "Spin City" for Seasons 5 and 6. 2002 - Golden Globe For his role on "Spin City," Sheen walked away with a Golden Globe for Best Actor in a TV Series, Comedy in 2002. 2003 - Two and a Half Men Following the end of "Spin City," Sheen's TV career continued with Chuck Lorre's "Two and a Half Men" on CBS in 2003. Sheen starred on the show alongside Jon Cryer for eight seasons. December 2009 - Domestic Violence Arrest In 2009, Sheen was arrested in Aspen, Colorado, for second-degree assault, menacing and criminal mischief following a fight with his then-wife Brooke Mueller. He pleaded guilty to a misdemeanor domestic assault charge. March 2011 - Meltdown Sheen was fired from "Two and a Half Men" in 2011 after publicly disparaging series creator Chuck Lorre in an interview. In a string of bizarre interviews and online videos, Sheen launched meme-worthy phrases like "tiger blood" and "winning," as well as lots of head-shaking. September 2011 - Comedy Central Roast The same year, Sheen was the subject of a Comedy Central Roast, featuring comedians like Amy Schumer, Jeff Ross and Anthony Jeselnik. June 2012 - "Anger Management" Sheen made his TV comeback in 2012 on the FX series "Anger Management," which aired for two seasons and a total of 100 episodes. November 2015 - HIV announcement Sheen appeared on the "Today" to announce that he had been diagnosed as HIV-positive four years prior. January 2016 - "The Dr. Oz Show" Sheen said on "The Dr. Oz Show" in early 2016 that he had been off of his HIV medication for "about a week" in favor of alternative treatment in Mexico. "So what? I was born dead," he said.